I've had a Tesoro Vaquero ("V" henceforth) for years and love it. But like always, I get the urge for something new (that's why I'm on my 3rd wife). So I bought a Deleon (D) online and tried it out. 1. The battery situation of the V (1-9v), as opposed to the D (8-AA) is obvious. 2. The V weighs 2.2 lbs and the D is 2.98. 3. The V beat the D in my depth test 90 percent of the time. 4. The Vaquero is capable of compensating for ugly ground conditions if you need it via a manual ground balance. 1. The D is better looking. 2. The Target ID (a big selling point for this machine) left me more confused than I would have been with a V in my hand. The visual readout jumps all over the damned place and doesn't settle down over time. Maybe if I stuck with the Deleon for longer I would have got more comfortable with it. Conclusion: I'm gonna keep going down that path into the woods that leads me to an 1863 Civil War camp site that nobody has ever detected before. And when I do.................. I'll have my old friend Vaquero with me. This is my forth Tesoro. I like all of them, but the DeLeon is my favorite. My other Tesoro's are beep and dig metal detectors. After using them for many years I decided to purchase a ID machine and decided on the DeLeon. Glad I did. The DeLeon's ID is pretty accurate. None of the ID machines are a 100 percent accurate. Like all of them, the DeLeon makes an educated guess. It does like coins and is dead on when it hits on a coin. Very good coin hunter. One example of making an educated guess is when it finds a pocket knife. Most knives are made of several types of metals. (Brass, copper, steel, etc.) The DeLeon will produce several numbers because of the different metals it is sensing. I found a rusty knife and almost did not dig it because of the mixed numbers. Glad I purchased the DeLeon. I got my Deleon from a friend who had sold it to me. At first I got it and it kept flipping out, it wouldn't stop with the "lift coil", I had noticed that someone had changed the original 89 elliptical coil for the 8'brown dounut. So I sent it in to Tesoro for adjustments to the coil. Since it wasn't under warranty I had to pay 50$. I had it back in a little bit over a week, now its pretty badass detector, I'm tryin to get use to the vdi, so I dig basically anything that sounds decent, but still use the vdi as a reference. With the 8" dounut it seems to be very touchy in trashy areas, so I'm planning on either getting the 5.75" coil are the 7" widescan for it. Hopefully it will help with the trash and narrow the vdi down better. All in all it is a very good machine, I wish I did have the original coil, I hear the elliptical 89 is way better for the Deleon then the 8" dounut. I also airtested a couple of coins with the descrim all the way down and the sensitivity at max, I noticed a little chatter but wow it was picking up a quarter at 11", a dime at 10", a pennie at 10", and a nickel at 11", to me that is pretty deep. When I get the new coil I will wright another review with that one, thanks. I bought the DeLeon used off e-bay. It was my very first metal detector. Like all the old timers tell you, you have to learn your machine. At first I dug everything. Now I have learned to use a combination of sound, target ID graph and the target numbers. Once you start to master that, this is a wonderful machine. Other detectors have real problems with nickels since they register close to pull tabs. The DeLeon will give a good solid stable graph on a nickel. I have found several. Coins almost always give a good solid 95. Other items will hit 95 and then jump to other numbers. Pinpointing is awesome! I have used a few other machines since I got my DeLeon and it out performs them all when it comes to pinpointing. Depth is very good. I have dug coins at 8 inches and dug a 22 short casing at 10 inches! I have not had any problems with the battery door. Cons: I too would like to have a backlight on the display. If the coil bumps a rock, branch or even very tall thick grass then the machine sounds off. Here in OK, I have noticed the machine is not as stable in very wet ground. Hunting right after a rain is difficult to identify targets and hard to pinpoint. For the money, this machine will out perform most in this price range and will keep up with some more expensive machines. I would rate it 4. 5 if it were available. My first detector was a Tesoro Inca that worked well and found me lots of good crud. After 20 years it fried and I replaced it with the Deleon. I find many more nickels but I hate the way it finds hot rocks. The old Inca had manual ground balance and was bettered tuned to eliminate this problem. I have not given up on Tesoro as I know the sound. Will purchase a tiger shark as it has a 3 turn potentiometer for ground balancing , is waterproof and more durable than a Deleon. I bought this machine today at waynes in okc they were very helpful on the instructions to get started brought it back to western okla. My family and myself decided to drive to the lake to try it out. The lake is way down this year already. We found a lot of dimes and pennies, on the beach, trust me for a beginner. I am glad I bought it. I will give this 4 fingers and 1 thumb up. Here's the deal on the Deleon. First, was hunting with a buddy and he had the Deleon and I had the Cibola.The Cibola is killer but I kept digging pull tabs and that was operator error but didn't know that at the time. He showed me which targets were pull tabs and sure enough, they were. Bought a used Deleon on Ebay in like new condition. Started hunting with it and liked it. One day I started finding reasons not to like the machine and when you do that it won't be long until you talk yourself out of a dang good machine ad into another one and so on and so on. Kept using it and kept thinking of how I disliked it until one day I started getting used to the machine. My budy was there to give me tips and it really helped. I have used this detector for about a year now and I can tell you not only that it's a pull tab but if it's a new tab or one of those older tabs that are round. No joke! I guess what all the guys say about learning to know your machine is right. Also, with all those machines out there, how can one brand not go as deep as another. What would be the point. I know that Tesoro doesn't make a machine that won't go as deep as a White's or a Garrett or a Minelab. They all work on the same principle. They all go deep if you set it up right and they all discriminate. Pick one learn it and really work it in the field. Not at home bench testing the damn thing. I have to say this much from what I have found. And read. Some reviews claim this unit will not give a true number as far as gold rings. I have read that some claim it gives numbers all over the board. Well As far as I have seen every gold ring I have tested including white gold and yellow gold. Have all fallen between 13-17 on the TID. Silver rings show as 95 as a coin. Tabs around 34-48. Pretty easy to operate and the ring air test have all hit at around 13inches. Thats sweeet. This unit will run with the best of them. 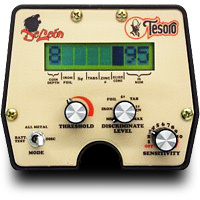 My only wish would be Tesoro Throw a TID on the Cibola with the different frequency shifts. Thanks Tesoro for another great unit. I've had this DeLeon now for about 4 mo. I upgraded to TID from a Tesoro Cibola. I found a lot of stuff with the Cibola, but also dug a ton of trash. With the DeLeon, I dig a lot less trash, fewer pulltabs, and a LOT more nickles. The display is accurate for the most part, if you pay attention to the number AND the bar graph. If you get a smear, it is likely trash. If it is a single bar, it's gonna be diggable, unless it is far left (iron) and showing 0/00 on the numeric. The depth meter is so-so. On larger items it is pretty accurate, but on small stuff like dimes, it reads too deep generally. But for now, I am keeping up with DH's Minelabs machines, and I know eventually I will snag some gold, especially since this DeLeon seems to love nickles! I received my Tesoro DeLeon about six Month's ago, and I can say, I'm Happy but not thrilled to the point of jumbing up and down. I got what I paid for. No problems with the battery compartment. I was looking for more in the way of the target ID however. I have a white's series 3 Di and, I think I like the white's better. It was made in the early 80's. Don't get me wrong, I like the Deleon but I was expecting more. I also own a Tesoro Vaquero and I am thrilled with that. I like the 1 battery rule for the Umax's. Anyway, still using it in the field and you cannot go wrong. Just my thoughts.